The island has a northeastern to southwestern direction and is about 12 km long and 6 km wide on average. The coastline is indented with up to 65 sandy beaches, inlets, capes and peninsulas. The southeast and southwest parts have gentler slopes and that is where most of the sandy beaches, settlements and facilities are located. The terrain is hilly but more rugged on the north coast, with the highest peak at 433 m. There is a communications tower on this peak. The Municipality of Skíathos includes the islets of Tsougria, Tsougriaki, Maragos, Arkos, Troulonisi and Aspronisi. They are scattered a few kilometres off the southeast coastline and are clearly visible from the town and the beaches. The larger island of Skopelos is visible from Skiathos with the more distant islands of Euboea and Skyros visible under very clear weather conditions. 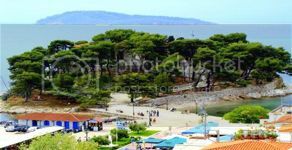 Total land area of Skiathos is 50 km².